C/ Roger de Lluria, 21, 08037 Barcelona, Spain. 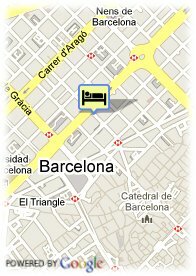 The Petit Palace Barcelona is located in Roger Lluria St. and Gran Via de les Corts Catalanes St., in front of the emblematic Hotel Ritz. Only a few meters away you will find the Paseo de Gracia, the street with boutiques and the most luxurious shops of the city. The famous Plaza de Catalunya and La Rambla is within a few minutes walking distance. Located in the heart of Barcelona, the Hotel Petit Palace Barcelona is ideal for both leisure and business travellers. Close to the major tourist attractions and shopping areas of the city, from Paseo de Gracia to the Gothic Quarter, going through the Plaza de Catalunya, allowing you to enjoy the city in a pleasant walk if desired. This hotel has a ground floor and four floors, offering guests 50 rooms equipped with the latest technological innovations. All of our rooms are provided with laptop and high speed internet access free of charge, DVD and CD player, bathtubs and hydro massage showers. The hotel also provides rooms for smokers, as well as rooms adapted for handicapped persons and for families. Meeting room of 300 m2 has a direct access to an outdoor terrace and free Internet access. Enjoy the exquisite breakfast buffet served every morning from 07:30 to 10:30 in our breakfast room where you can enjoy the typical Mediterranean cuisine and a variety of cured hams, pastries, wide selection of hot dishes and fruit season. For sports enthusiasts the hotel offers a fitness room with free of charge sauna throughout your stay. Pets are welcome, if you note it in your booking we provide pet beds and food bowls. Centre, Museum Area, Near the historic centre, Near subway / tramstation, Near shopping centre.